Statistical Graphics and more » Blog Archive » Soccer: Can Money buy a Good Team? Soccer: Can Money buy a Good Team? Posted on 12/20/2010, 22:38, by martin, under General, Soccer, Sports. The German Bundesliga has its (very short) winter break after 17, i.e., half the games played. We all know – or at least would not disagree immediately – that good players will cost a team a fortune, and the more a team can invest, the better will be the result. 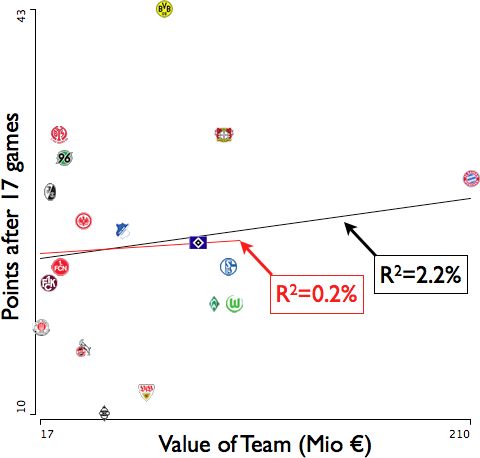 The R^2 is at mere 2.2% for all teams and at vanishing 0.2% if we leave the outlier FC Bayern out (red line). The team managers will hate me for this, but money does not really make the day here. I did something with far more remedial skills looking at Major League Baseball statistics with an excel dashboard. Interestingly enough: Of say….the top 10 teams for a given year, it seems that 7 of them will be spending more than average. For the top 10 spending teams, most of the time all but 1 will be performing above .500. I don’t really have the skills to analyze it any deeper. But I would say that there’s definitely a relationship between how much money you spend and how your team performs. there is certainly a correlation between money spent on a team, and the success – at least in the long run. The “funny” thing with this first half of the Bundesliga season is that somehow the expected correlation does not work – which can easily happen if the window of time is not too big. Fortunately it seems that the old rule “money can’t buy you goals” is sometimes still valid, otherwise football would be quite boring. > btw. 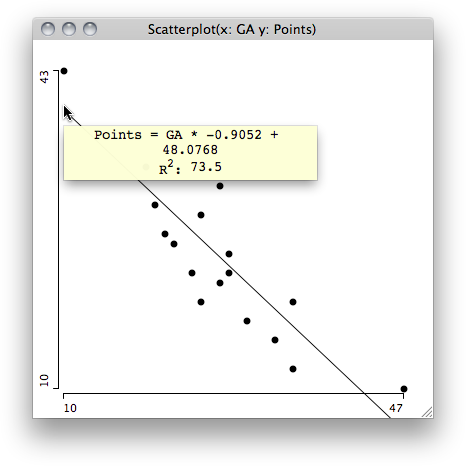 Why is Stuttgart so close to the x-axis?